After already having a £10 million bid rejected by Celtic, Birmingham have returned with a substantial £14 million offer for winger Aiden McGeady. Alex McLeish has seemingly given up on tempting Liverpool flop Ryan Babel to St. Andrews and has instead made the Republic of Ireland international his top target during the transfer window. Celtic are understandably unwilling to lose their most prized asset as McGeady has been one of their most outstanding performers in what has been an inconsistent outing so far this season for the Glasgow club, but Birmingham are keen to bring the tricky winger (who, for me, is reminiscent of a young Damien Duff) to the Premier League. McGeady looks like a wonderful talent with significant potential for improvement and securing the Irishman’s signature would represent a fair old coup for Birmingham as a host of top European clubs are said to be tracking the 23 year old (Bayern Munich and Juventus are known to be admirers of the midfielder). To me £14 million sounds a bit on the heavy side for a player whose ‘final product’ has been bought into question numerous times and has a track history of reacting badly to critcism (I think Gordon Strachan would testify to that) but it seems it is going to take a sizeable bid to tempt a reluctant Celtic into selling. 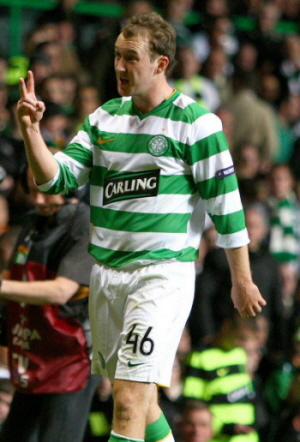 If ‘Big Eck’ can iron out the kinks, do you reckon McGeady would be good value for the money in question? Personally I think Aiden McGeady would be a steal at £14 million. Aiden is by far the best footballer in the SPL. As you point out he is being watched by a number of top European sides. He is young but has amassed a wealth of experience on both the European and international stage with Celtic and Rep of Ireland and has gained plaudits from many top European mangers. He has continued to improve this season and has the makings of a world class footballer. I would not wish to see him leave Celtic but like every other player he has his price. A genuine bid of 14mil cash may well be enough to make the Celtic board decided to part with their number 2 asset (Number 1 being the Celtic support) and use the money to allow Tony Mowbray overhaul the Celtic squad. Aiden wishing to move to Birmingham is an entirely different matter. With the greatest respect he may see this as a retrograde step in leaving a huge club for a team of Birmingham’s stature albeit they ply their trade in the EPL. I doubt he would be so reticent if a major club were to make a bid. If he does move to Birmingham you will have a major talent in your squad. 14 mil may sound a lot but in 3 years if he performs as the Celtic Fans know he can he could be worth double this amount.